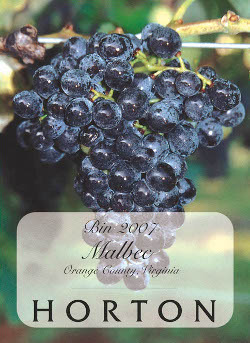 Malbec is native to South West France making it ideal for Dennis Horton's visions of great Virginia wine using the Bordeaux grapes. It's often used to add complexity to blends. It's thin-skinned and needs more sun and heat to mature than some other varietals making it a little harder to grow. It can bring very deep color, strong tannins and a distinct raspberry flavor. We describe our Malbec as soft in tannins and lower in acidity with strong raspberry fruit and herbal aromas.